Among the country’s 50 largest apartment markets, Phoenix and Las Vegas remain the clear leaders for rent growth in 1st quarter 2019. The two Southwest markets recorded annual increases around 8% in the quarter, well ahead of all other large markets. 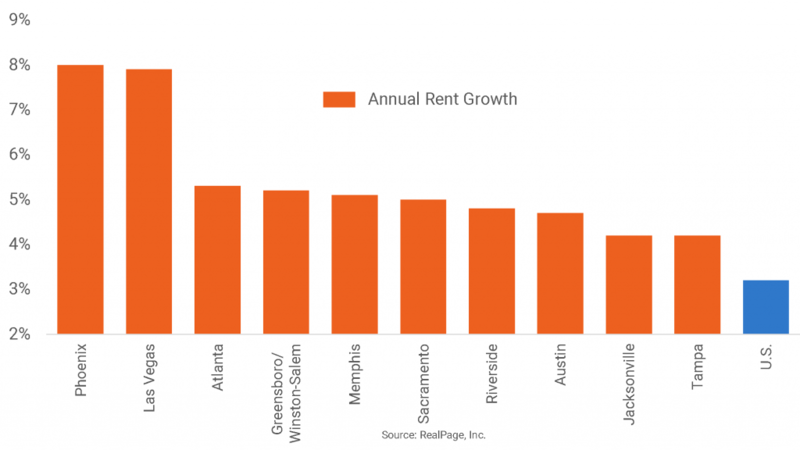 At the next tier of performance, rent growth reached 5% or a little better in Atlanta, Greensboro/Winston-Salem, Memphis and Sacramento. Rounding out the top 10 rent performers in the quarter, Riverside/San Bernardino, Austin, Jacksonville and Tampa Bay all posted annual rent growth of more than 4%. Fourteen other large markets posted rent growth above the national average of 3.2%. At the opposite end of the performance spectrum, Houston recorded the nation’s weakest performance among big markets, with same-store rents in 1st quarter 2019 essentially matching prices a year earlier. Four other top 50 markets recorded rent increases of less than 2% over the past year: Cleveland, Kansas City, Anaheim and St. Louis.